An example of a technology shock is the emergence of the Internet since the 1990s, resulting in opportunities for entrepreneurs to create new companies, new business models, and new wealth. Alternatively, a shock could be something very specific to an industry. An example from agriculture in the last 10 years was the policy shock of Congressional biofuel mandates, which greatly expanded the opportunity for ethanol production. Use of corn for ethanol production moved from about 1 billion bushels per year to 5 billion bushels in a relatively short period of time, a significant change indeed. An interesting change that is just beginning to have some impact in agriculture is shale drilling. The technique of cracking open shale rock to release oil and natural gas has spurred many deals in the energy industry. 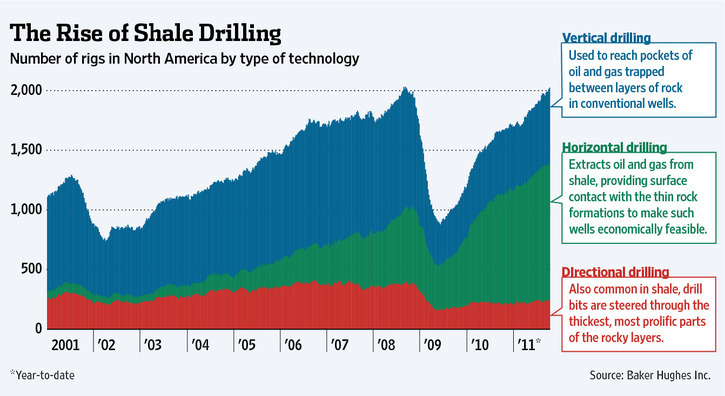 Shale discoveries have reinvigorated U.S. oil and natural gas production. It wasn’t that many years ago that domestic production of either was viewed as in terminal decline. By the beginning of this year, the shale boom has already created a number of new billionaires. In economics classes we distinguish between moves along the supply curve (changes in supply) versus moves of the entire supply curve (changes in quantity supplied). The distinction is important because a movement to the right in the quantity supplied of natural gas implies bigger long term changes. At Decision Commodities, we had some risk management products retrofitted for large buyers of natural gas, with our major customers being ethanol plants. During the 2005 to 2006 time period, I distinctly remember the ride with natural gas futures prices going from below $5/btu to about $16/btu. It preceded the big rise in grain prices, and I had never experienced the magnitude of these commodity price changes with a client up to that point in time. Today, there is a glut of cheap natural gas, and it shows in prices of natural gas, where futures closed last week below $3.00 per btu for the first time since a brief period in 2009, but in reality hearkening back to the period 0f 2002 and prior. Beyond just lower prices, a shift in the supply of natural gas also creates opportunities, particularly in energy intensive industries such as agriculture. I was reminded of this last week when visiting with my brother, a farmer in Nebraska. About ten years ago he shifted many or most of his irrigation motors from natural gas to diesel fuel. Natural gas prices had risen relative to diesel fuel and it was time to replace aging irrigation motors anyway, so he purchased a small fleet of four cylinder diesel engines that were quite efficient. Fast forward to today and the reverse decision may make sense. Natural gas prices are low again relative to diesel fuel and it’s time to replace some engines. Perhaps it’s time for a switch back to natural gas? The issue also impacts the cost of nitrogen fertilizers, something important to crop production. The U.S. has suddenly went from a high cost market for nitrogen to one of the lowest cost in the world outside the Middle East. The economics have changed significantly for producers of nitrogen fertilizers as natural gas is by far the biggest raw-material cost for making anhydrous ammonia. The CEO of CF Industries, on of the big anhydrous fertilizer manufacturers, was recently quoted that the company has has moved from a being a high-cost producer by world standards to a low-cost producer. CF plans to spend $1 billion to $1.5 billion over several years to boost capacity at some of its North American plants. In the U.S. Corn Belt, fertilizer accounts for about 30 percent of non-land production costs of corn, nitrogen the biggest part. While lower natural prices are not yet reflected in prices of fertilizer, over the longer term it will have an impact. If the U.S. Corn Belt gains some advantage in fertilizer prices relative to other countries who export grain and meat products, another degree of comparative advantage in export markets will result. The impact of shale drilling technology has touched many aspects of the economy and will continue to in expected and unexpected ways. In northwest Iowa, for example, one can hear radio ads for workers needed in the oil fields of North Dakota. Another example is in major league baseball. In October the Texas Rangers played in its second consecutive World Series. The St. Louis Cardinals won the Series, but the Rangers have certainly enjoyed multi-season success. The Rangers increased player payroll is covered by a new owner, Bob Simpson, whose shale-focused XTO Energy was acquired by Exxon Mobil in 2009 for $25 billion. Play ball!